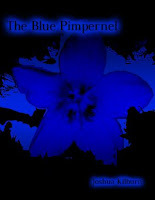 Ana Mardoll's Ramblings: Author Interview: Josh Kilburn on "The Blue Pimpernel"
Author Interview: Josh Kilburn on "The Blue Pimpernel"
Ana: Today we have Josh Kilburn introducing their book, The Blue Pimpernel. I haven't read this book myself, but Josh was kind enough to agree to guest blog about their book to any readers who might be interested in the subject. Josh, how would you describe your book to your prospective readers? In broad terms, what is your book about? Josh: The Blue Pimpernel is set in 2041, but you could be forgiven for reading it as being set in the 1990s. It's about a teenage girl named Renee Rhee and her friends, Ofelia Stratford and Cyan Brooklyn, as they step up against the ruling political party, the Party of American Patriots, and the criminal elements that prop up the Party at the local level. The Party has been in power for at least 20 years, controlling American politics from the local level on up. They've kept any technological or scientific advancement at bay, and eventually managed to roll back the tide of change, breaking society in the process. The Party is propped up by the criminal families, powerful organizations spawned by their "moral regulations", who survive on a thriving black market trade. When this rampant corruption steals away the life that Renee knows not once but twice, she and her friends decide enough is enough and they step up to the plate with the intent of undermining the Party. It's a hard science fiction superhero story, but it blends elements from a few different genres. Trigger Warnings: the novel has a great deal of violence. There's also two instances of attempted sexual violence and subsequent victim blaming, and there's frequent use of the very harsh language by the characters and rare usage of racist, homophobic and misogynist language by the characters. The novel has a very realistic portrayal of mental disorders; the protagonist and one of the antagonists are both non-neurotypical, and there's references to an abusive parent/child relationship. Josh: Hope is the most pronounced theme. Renee adopts the mantle of the Blue Pimpernel because a) she's emotionally blackmailed by her best friend into doing it but, more importantly, she convinces herself that she's doing what she does in the hope that she can create a world where people don't have to go through what she's gone through (both times involve a bomb and a great deal of corruption, and losing something important to her). She picks up the mantle because she wants to reshape the future with hope, rather than allow it to be shaped by the endless cynicism of the Party. Friendship, love, and teamwork are also very strong themes. Renee accomplishes a lot with her friends, Ofelia and Cyan. She loves her adopted family (and they love her back), she loves her best friend, and she supports her friends the best she can in the face of her own problems. Together, the three of them (eventually five) step up to the plate and prove just how powerful a force friendship and love can be in motivating hope. Classism, wealth, and power are also elements of the novel. With one exception - Aya - the protagonists are all from the working poor. With the possible exception of three - Godwin, Anderson, and the last antagonist they face in the novel - the antagonists come from the wealthy upper crust. The Party is run by the wealthy, the white, and the male and they make little secret of it. Some are more blatant about it than others. Justice and its relationship with power and wealth is also a minor theme - a minor theme that develops into a major plot point near the end of the novel. Josh: I wanted to write a poor Batman. Bruce Wayne lives a life that's utterly alien to me. He doesn't have to worry about whether or not he can pay bills each month. He doesn't have to worry about losing his phone service because he forgot that his payment is in the middle of the month, or he didn't have the money to cover it. He doesn't have to worry about whether or not he'll be able to afford food and bills for the month. I can't relate to a person who doesn't have to deal with this day in and day out. Renee's families - both of them - come form the working poor/lower middle class. She knows what it means to be poor, even if she is just a teenager. She goes to a crappy private school, deals with nasty and abusive authority at the bottom of society, and fights just to stay afloat on some mornings. I also wanted to take a number of tropes commonly associated with the genre and flip them on their head; most of them tropes associated with race or gender. For instance, Renee is half-Korean and half-white. However, it's her father who's Korean and her mother who's white. Renee is not school material; she doesn't do well in the school environment, but she's an excellent athlete and is quite smart in her own way (body-kinesthetic intelligence), and is very literate and well-read, quoting the opening refrain from Dante's Inferno from memory at one point. She is in a very loving and supportive relationship with her adoptive family, even if it is extremely trying sometimes. Ofelia, her best friend, is a social butterfly, the most classically feminine of the protagonists, but she's also got a very good grip on mechanics; the boys go to her to get help with repairing an engine at one point in the novel. She can also pick locks, something she learn ed to do on those cold mornings when Renee would accidentally lock the keys in the car before they could get to school. Those are just an short sample of some of the tropes that I try to invert, zig-zag, or deconstruct in the four major protagonists. Josh: My influences are likely the closest things I can draw comparisons with. I was influenced by Watchmen and V for Vendetta, and to a lesser extent, Kingdom Come and the Dark Knight movies. However, it's not an exact fit; I lack the white male protagonist, and the themes of the novel fly right in the face of the themes in Watchmen or V for Vendetta, so my novel is superficially similar. I was also distantly influenced by 1984 and The Handmaid's Tale, and while it's visible in the existence of the Party and the policies they take, they act more as the support for the building the ladder that my novel is standing on is leaned against, rather than the ladder itself. Josh: This is my first published book, but I've got a lot of other novels in the wings. I selected this one because as I look back at the novel and see what all has happened in the six years since I've started this, I've been pretty accurate in the predictions. Some of my beta readers asked me if the Party was influenced by the Tea Party, especially due to how they arrived on the scene - they metastasized one of the existing political parties - but no. The Party as I conceived it has not changed in the 7-to-8 years since I started working with it. I also learned that some of the technology I was using is coming out now (the armor that the protagonists use, for instance). I joked with my friends that I decided to publish before "Real Life could steal any more of my stuff." The Blue Pimpernel took 6 years to write, but most of it was just an inability to get a draft that I was happy with (the Party predates the Blue Pimpernel, because it came from another novel I wrote). Once I had the draft, it took me roughly a year and a half to get it together. It's the first novel in a planned series; the second one, Entropy, should be out in 2013/2014. I'm also working with a series of other novels, not all of them being science fiction. In fact, I like working in a wide variety of genres, and I like mixing those genres to create new effects. Josh: Because I'm a neophyte at this, I ended up creating three different versions of the same novel. The first version, and the cheapest at $2.99 USD, is the ebook. You can find that on Lulu, on B&N for the Nook, or on the iBookstore (so I'm told. I can't find a link, so I don't know for sure). The next two copies are dead tree versions. There's no difference between the two besides size, page count, and the fact that one has a copyright page and the other doesn't. The $9.99 USD Digest size has 454 pages, but it doesn't have an ISBN-13, so it can only be sold on Lulu. The next, the $17.95 USD US Trade has 292 pages and it has an ISBN-13, and should be avail able on Amazon whenever that happens. I do have a blog, and I do post updates on the book there. You can follow me here. Josh: You can find a free sample in two different places. The B&N sample is here but you have to be a member to get it (I tried. I'm not a member, so I couldn't). Lulu supplies a free sample on the page selling the dead tree versions to anyone, you don't need to be a member to get it. Thanks again for giving me the opportunity to do this, I really appreciate it. I'm stunned. Really and truly stunned. He names his book "The Blue Pimpernel" but makes no reference whatsoever to Baroness Emmuska Orczy or the French Revolution. And when you ask about his influences, and he doesn't mention the obvious, there's no "Well, what about...?". It's not a huge thing -- just made me go "wha....????" I didn't list it as an influence because it really wasn't one. I've heard of the Scarlet Pimpernel before, and I've read synopses and gotten third hand information about it, but I've never actually seen or read the primary source itself. I started the novel about 6/8 years ago; this back when I was a teenager and I thought "I knew what real art was" - that is to say, the most pretentious, obscure, and complicated tripe you could pony up for consumption, to try and get the academics arguing about all of the intellectual and neat symbolism that you managed to shove in there -story? What story? There was symbolism! It was art! Take me seriously! I'm a boneheaded 19 year old who knows everything! *ahem* Anyway, I named the book "the Scarlet Pimpernel" first, despite never having read the novel, in an allusion to that particular character. As I matured, and continued writing, the name sorta stuck; I grew to like it, but didn't know if it was fitting or not. I read up a bit on the Scarlet Pimpernel and realized that it wasn't what I wanted, but I'd grown so attached to the name that I didn't really want to give it up. The real thing that made me give it up, though, was the legality; I wasn't sure if it would be legal or not and didn't want to find out the hard way and couldn't find out the easy way. So I went digging and learned about a relative flower, the blue pimpernel, and decided that was better and changed the novel title - and the primary heroine's code name - to that, instead. Thus, she became the Blue Pimpernel. So I didn't feel like I could list it as an influence, because it really wasn't. Despite the names being similar (and the same in the earlier drafts), they're not remotely related and the novel was far from my mind when I cooked up the final draft. However, I do pay homage to it; Ofelia makes a reference to the Scarlet Pimpernel (Renee, who's read Don Quixote and quotes the opening stanza from The Inferno from memory, has never heard of it), and Ari, one of the antagonists, refers to her as something close to "a blue collar Scarlet Pimpernel", but that's about the extent of the influence it had.